The ACW filter uses the conventional autobackwash technology and consists of filter housings assembled in multiple banks which are skid mounted and equipped with headers and manual and automatic on/off valves. The banks operate in parallel, with each bank handling a portion of the total process flow. The major feature of ACW Filter is that while the automatic backwash is running in one bank at a time, all other banks are still in the filtration mode. Two options for backwashing are available, using internal fluid or using external fluid. The backwashing can be initiated automatically, based on the pressure drop set point, by time or by operator request. The operator can manually trigger a backwash sequence, which is then performed automatically. The housings of each bank are cleaned one by one and the banks are also cleaned one by one in sequence. 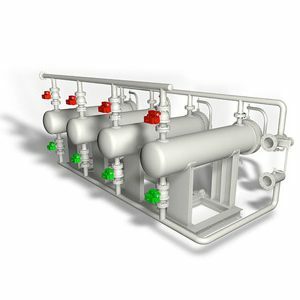 Filter housings can be installed either vertically or horizontally in each bank, depending on the available plot plan, thus providing flexibility and improved maintenance access. These filters are used for continuous service and during the backwash of a single bank the other banks continue the filtration.